With the increasing pollution and the heat of the sun, you have to take extra care of your skin to keep it healthy and beautiful. Some are fortunate enough to have glowing skin naturally. But some, especially those who have sensitive skin, have to work hard to keep it glowing and clear. 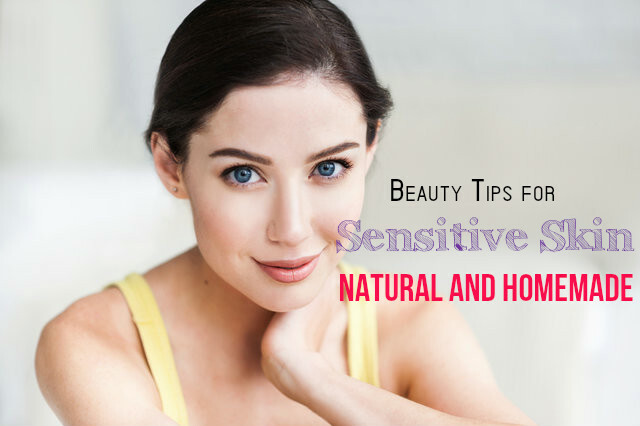 How to know whether you have a sensitive skin? Does your skin feels tight or uncomfortable immediately after you wash our face? Do you get rashes and spots more often than people? Does your skin get tanned easily when you go in the sun? Do most of the cosmetics make your skin uncomfortable? Does your skin react adversely to artificial colored cosmetics and chemicals? Are premature wrinkles and fine lines appearing on your skin? Is your skin itchy and susceptible to flaky dry patches? If your answer is ‘yes’ to majority of questions, then you have a sensitive skin. In that case you need to take extra care and maintenance to keep your skin in good condition and prevent any damage to the skin. Never test on new products, especially before you go for a party or an outing. This may cause reactions on your skin and make your skin worse. You must always use those that you have used before or the products that your dermatologist has prescribed for you. When you choose cosmetics for sensitive skin, remember to choose products that are fragrant free. This is because most of the products that are fragrant react on your skin and lead to skin issues. The best is to select products that are labeled ‘No artificial colors’. One thing you have to remember is to drink lots of water. Make sure that you drink at least 8 to 10 glasses of water daily. This will help in flushing out the toxins from the body and providing you a radiant and flawless skin. External factors like pollution, smoking and lack of sleep can affect sensitive skin and lead to rashes and even serious skin problems. Some of the ingredients present in cosmetics may not suit sensitive skin. So, it is important that you check the ingredients present in the product you buy. This way you can prevent any reactions that may take place when you use it. Most of the beauty parlors do skin test first to find out which skin care products suit your skin type. Make sure that you eat healthy foods. This helps in removing toxins from the skin and giving you a glowing skin. Remember to drink lots of water and fresh juices. These help in keeping your skin well hydrated. Having certain foods can cause adverse reaction on the skin and increase the sensitivity of the skin. Check them out and avoid such food items. The heat of the sun can cause damage to the skin cells and give rise to rashes and skin diseases. Wear sunglasses and sun lotions with high SPF to protect your skin from the UV rays of the sun. Try not to go out in the sun often. Moisturizing your skin must be an unavoidable part of your skin care regime for sensitive skin. This helps in locking the moisture in your skin and prevents dryness of the skin. You can use one that is suitable for your skin. Organic moisturizers are good for sensitive skin. Many companies have launched special moisturizers for sensitive skin. You can try one of them to get the expected results. Do not use face washes and soaps that contain harsh chemicals in them. These can dry you skin and also cause damage to the skin. You can use mild hypoallergenic cleansers to clean your face. Along with your face, it is also important that you take care of your whole body. You can use shower gels and good quality moisturizers that suit your skin and make your skin soft, supple and radiant. One of the effective homemade face masks for sensitive skin is yogurt and oatmeal mixture. Mix both the ingredients well and apply this on your skin. This helps in removing dead skin cells and tan, without allowing the moisture to escape from the skin. Using this face mask regularly will provide you a glowing and flawless skin. Before you use a new product on your skin, it is very important that you have a skin test and make sure that the ingredients in that product are suitable for your skin. To do this, apply a small amount of the product on your skin for 48 hours and see if there is any reaction. You must not test it by applying it on your face. The skin in the eye area is more sensitive than the skin on other parts of the face. So, you have to use good quality eye creams and cleansers on this area before you go to sleep. You can use facial wipes, instead of using harsh towels and rubbing your face. Make sure that you do not use alcohol toners on your face. You can dip a cotton ball in rose water and dab it on your skin. Wash your face frequently to remove impurities and keep your skin hydrated. It also prevents clogging of the pores. Pat your skin dry instead of rubbing the skin.